Despite its obvious shortcomings, the Telstra T-Touch Tab is a reasonable multimedia device and Google's Android operating system is far less restrictive than Apple's iPad/iPhone platform. The T-Touch Tab is effectively alone as an affordable, entry-level tablet that doesn't skimp on too many features. Retailing for just $299, Telstra's T-Touch Tab is one of the first Android tablets to launch in Australia. Its 7in resistive display isn't as impressive as the capacitive touchscreens used by the Apple iPad and the Samsung Galaxy Tab. Its performance also isn't as impressive as more expensive tablets, and its battery life is poor; however, the T-Touch Tab remains good value despite its quirks. Check out the roundup of the Best tablets for Christmas in our holiday gift guide. How does the Telstra T-Touch Tab compare to the benchmark? Read our Apple iPad review. The Telstra T-Touch Tab won't win any design awards, but the device feels sturdy enough and reasonably well constructed. The Huawei-built tablet is a lot heavier than it looks, but can be held comfortably with a single hand (unlike the larger iPad). We particularly liked the flip-out stand on the rear, which is great for watching videos, as well as the physical home, menu and back keys on the left side of the display. There is also an optical trackpad that is similar to the one found on the latest BlackBerry smartphones. It is perfectly positioned when you hold the T-Touch Tab with two hands. Build quality is reasonable for a device at this price, aside from the rear battery cover, which doesn't always click into place correctly. The T-Touch Tab has a proprietary port at the bottom that Telstra says will allow future development of accessories, including docks, cases and chargers. One design annoyance is the fact the T-Touch Tab doesn't charge via a standard micro-USB port, instead using a separate power connection. We liked the microSD card slot at the bottom of the device; it is easy to swap cards and doesn't require the rear cover to be removed like with most smartphones. Telstra includes a 2GB card in the sales package. The Telstra T-Touch Tab has a built-in kickstand that makes it ideal for watching video content. The weakest aspect of the Telstra T-Touch Tab is its 7in resistive touchscreen, which isn't as responsive as a capacitive screen. It is particularly annoying when scrolling through Web pages or menu lists, and selecting linked text in applications like Facebook is hit and miss. Once you get used to employing a bit more force than usual when tapping or swiping, the experience improves, though it still isn't as slick as its higher priced rivals. On a positive note, the resolution of 800x480 pixels makes text relatively crisp, although viewing angles are poor, as is legibility in sunlight — the screen is quite reflective and is hard to see if you are viewing it off centre. The Telstra T-Touch Tab runs the 2.1 version of Google's Android operating system. Android 2.1 hasn't been designed for a tablet, so some apps do not display correctly on the larger-than-usual 7in screen. We tested the official Twitter app for Android, the DoubleTwist music app, PaperToss and Shazam, and none of them would display in landscape mode. The Facebook app also reverts to portrait mode when in the main menu, though your news feed and profile will display in both orientations. 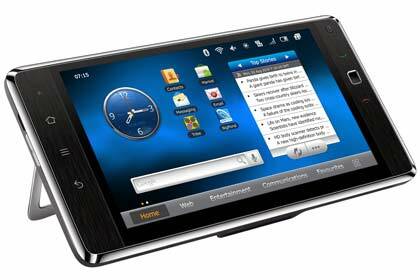 Telstra says the T-Touch Tab "should" be upgradeable to the latest 2.2 "Froyo" version of Android, but this version hasn't been designed with a larger screen in mind either. Despite this issue, most apps we tested displayed correctly and fitted the larger screen without any issues.